On Sale Now! 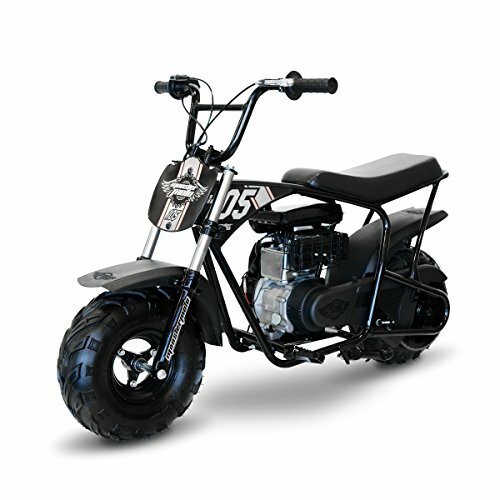 Save 9% on the Monster Moto Limited Edition Black on Silver 105CC Mini Bike with Front Suspension-MM-B105-BBX by Monster Moto at Kart Racing Network. MPN: MM-B105-BBX. Hurry! Limited time offer. Offer valid only while supplies last. Make next weekend epic with our affordable and popular Classic Mini Bike. It's just like the ones we used to have in the good ol' days, only safer and easier to ride. Its 105cc overhead valve engine and automatic clutch ensure easy operation, while its rugged steel frame and no-dent fenders provide the toughness you need to conquer the outdoors. All of our mini bikes come pre-assembled. Just attach the handlebars, add gas and go! Make sure you tag us in your pictures with #goMonsterMoto! Proudly Assembled in Ruston, LA USA! *Simple to set up: Tool kit included. Just attach handlebars, add gas and go! *Easy to handle: The mini bike's large comfortable seat, spring loaded foot pegs and motorcycle style throttle ensure a great ride. *Safety first: With a chain guard, exhaust heat shield and engine stop switch, our mini bike was built with safety in mind. *Built to last: With a powder coated gusset reinforced welded tube steel frame and tough no-dent polypropylene fenders, our mini bike is durably constructed and ready for the rugged outdoors.